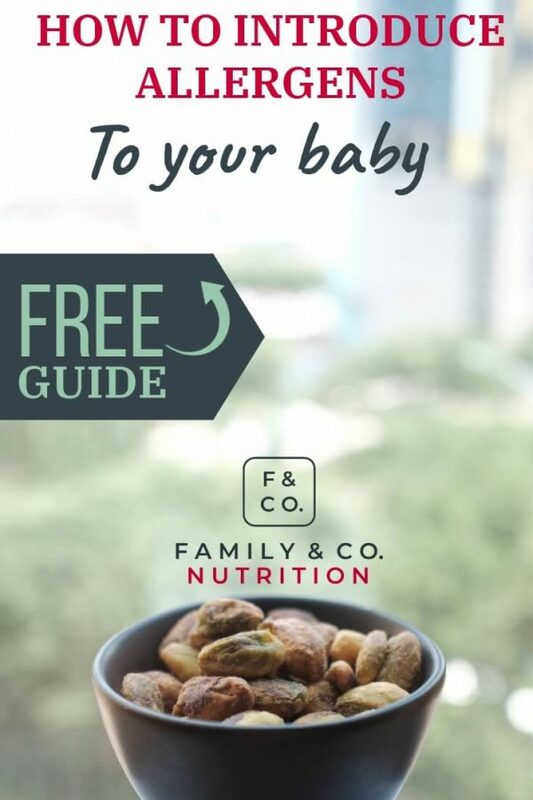 How to Introduce Allergenic Foods to Baby | FREE Allergen Safety Guide! As baby approaches 6 months of age, it’s time to start solid foods! 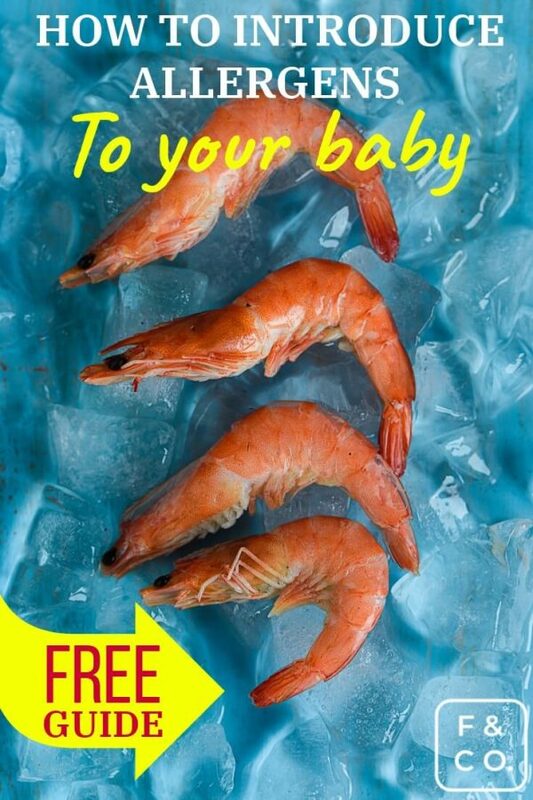 There’s a lot of pleasure helping your baby discover new tastes, flavours, and textures. Just like preparing for food choking safety (and know the difference between gagging), it’s a good idea to learn about allergic reactions and know what to look for. Is my baby at risk of allergic reactions? Your baby might be at increased risk of allergies if one or both parents, or a sibling has an allergic condition. Allergic conditions include asthma, atopic dermatitis, eczema, hay fever (conditions regrouped and often referred to as atopy), or food allergies. If your baby has severe eczema, s/he might be at increased risk of having food allergies. Consult your family doctor about the best strategy to introduce common allergens to your baby. New Canadian guidelines released in early 2019 are clear about introducing allergens early to at high-risk babies. They may not be the same recommendations you heard if you have older children. Your doctor may refer you to an allergist, where a multidisciplinary health team will support your family. Your child might be at risk of allergic reaction if other members of your family have allergies. What causes food allergies in babies: what is an allergen? An allergen is a protein that our body sometimes recognizes as harmful. The immune system reacts as it mistakes it for something potentially dangerous. That will create an allergic reaction that can vary in severity and its symptoms. An allergen is mistaken for a dangerous intruder by the body, and a reaction occurs as a defense mechanism. 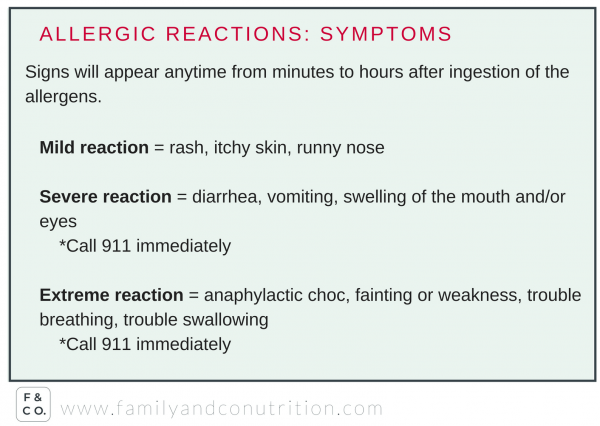 After ingestion of an allergen, a reaction can occur in minutes, or up to two days later. The visible signs of the allergic reaction will vary depending on the child, severity of the allergy, and the dose of allergen eaten. An allergic reaction will happen every time an allergic child eats that food. 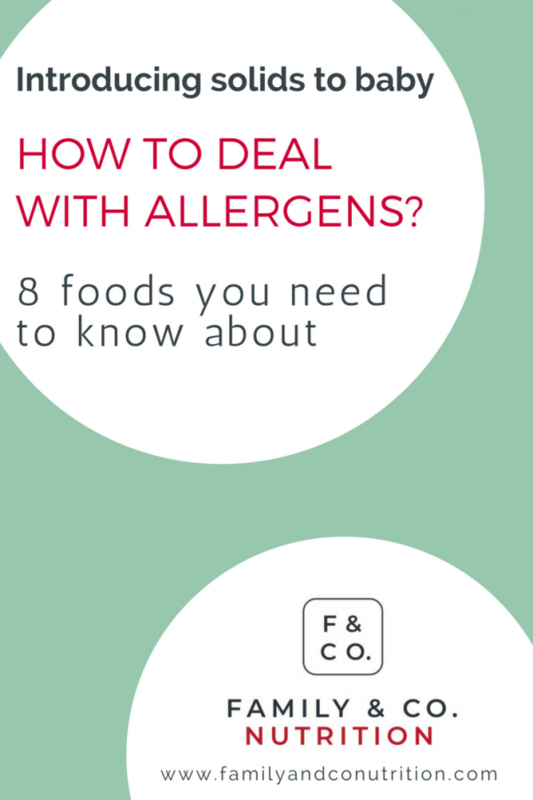 The consequences of food allergies can be very serious. An allergic reaction can vary in severity and symptoms, but can be very serious. What to do if my baby has an allergic reaction to food? When to introduce potential allergens? 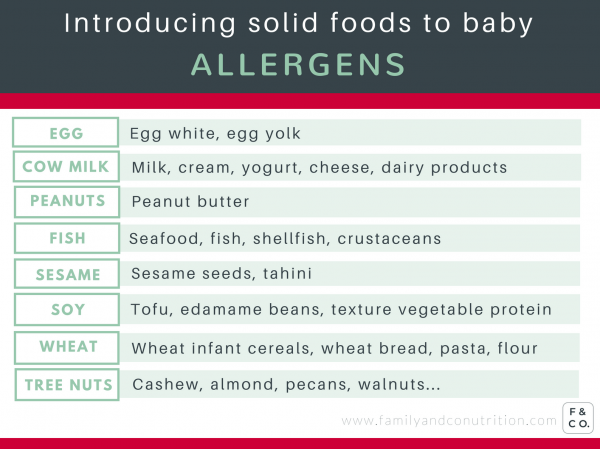 For babies not facing a high risk, introduce allergenic foods when you introduce solid food. This is around 6 months of age, or when baby shows signs of readiness. There is no benefit to rushing the introduction of allergens for these babies. The opposite is also true. There are no benefits in delaying food allergen introduction for most babies. In fact, delaying may lead to greater allergy risks. For high-risk babies, the new Canadian Pediatric Society 2019 guidelines recommend the following: introduce allergens as soon as baby is eating solids, around 6 months old but not before 4 months old, and follow baby’s signs of readiness for solids. If you’re nervous about your high-risk baby, contact your registered dietitian and doctor. Together, you can decide the best approach for your family. Wanting to reduce allergy risk is normal, but you have to consider several factors: breastfeeding, baby’s health, family settings, etc. We cover more about allergies in this post. For most babies, allergens should be among the first solid foods. Should I avoid allergenic foods during pregnancy to protect my baby? No. Even for babies at high-risk, avoiding food allergens is not suggested during pregnancy. 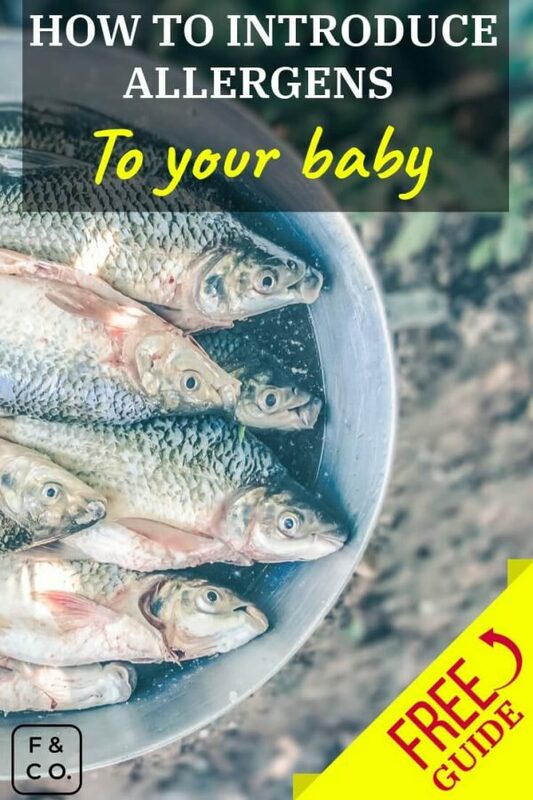 Avoiding fish or peanut during pregnancy won’t prevent your child from being allergic to fish or peanuts. Recent evidence suggest that avoiding and/or delaying allergens can backfire and actually lead to allergies. So, unless you are allergic yourself, don’t exclude any foods from your diet. 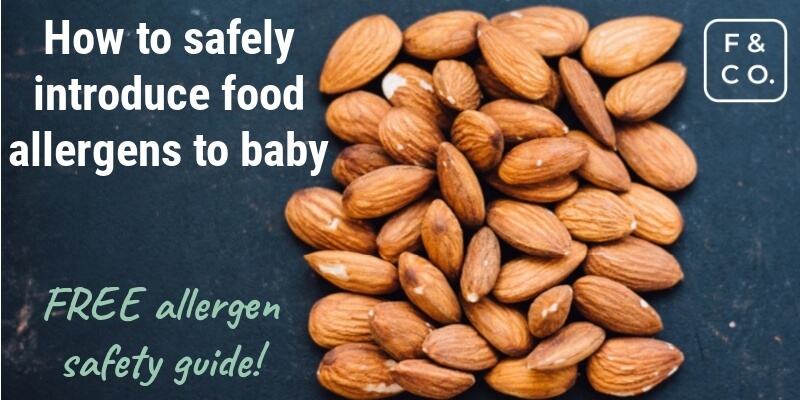 There’s no benefit to excluding allergens from your diet during pregnancy to protect baby. Should I avoid allergenic foods while breastfeeding my baby? No. It is not recommended to avoid allergens when you are breastfeeding either. It doesn’t offer any benefits for baby, unless there is a diagnosed allergy or food intolerance for you or baby. A typical case is cow’s milk protein allergy. Mother’s can continue breastfeeding if she excludes food sources of cow’s milk protein in her own diet. 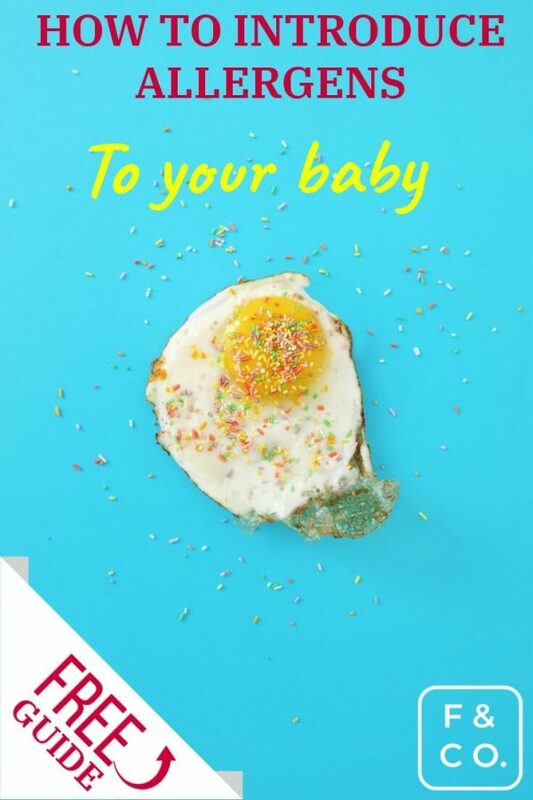 Consulting a registered dietitian is highly suggested so that the mother’s diet stays balanced, baby’s symptoms remain under control, and that the breastfeeding experience remain a positive one. Unless you or baby have an allergy, there is no benefit in excluding allergens from your diet during breastfeeding. Should I delay introducing allergens to my baby beyond 6 months of age? The latest scientific evidence is clear: there are no benefits in delaying introduction to solids food, including allergens, past 6 months of age . Delaying allergen introduction may even increase the risk your child develops an allergy. At around 6 months of age when baby starts solids, be sure to introduce the common allergens. Help maintain oral tolerance by regularly offering the tolerated food allergens. One of the best ways to reduce risk of allergies is to introduce allergens as soon as baby is eating solids. 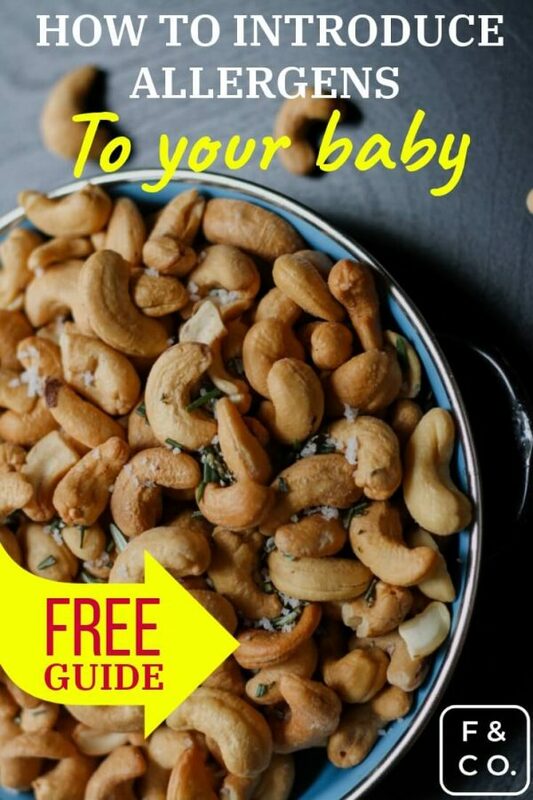 Should I introduce allergens to my baby at 4 months of age? If your baby is at high-risk for allergies and is ready to eat solids, it might be worth offering food allergens at 4 months of age. For high-risk babies, several factors can play a role in reducing the risks of food allergies. Parents must consider the trade off of exclusive breastfeeding on allergy prevention versus the benefits of early introduction of allergenic foods to their baby. Parents also need to consider the readiness (or not) of their baby for solid foods. Consulting a registered dietitian can help you take the best decision for the family. 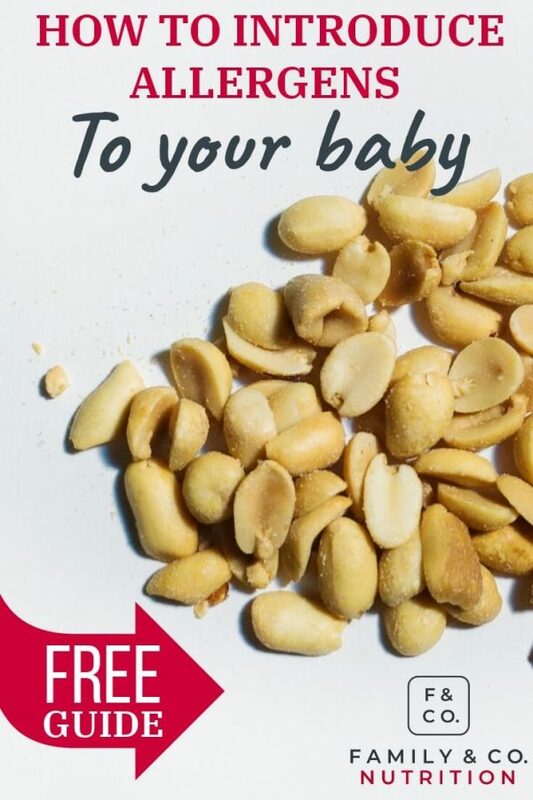 Current recommendations and evidence on peanut allergies support solid food (and allergen) introduction around 6 months of age, for most babies. At this age, baby is physiologically ready and needs iron-rich foods. It’s an ideal time to introduce various food textures and flavours. This includes regular allergen exposure to maintain tolerance. We recommend you introduce allergens to your baby at 6 months of age. Not before, and not after, unless baby is at high-risk of allergies. How to introduce potential allergens? 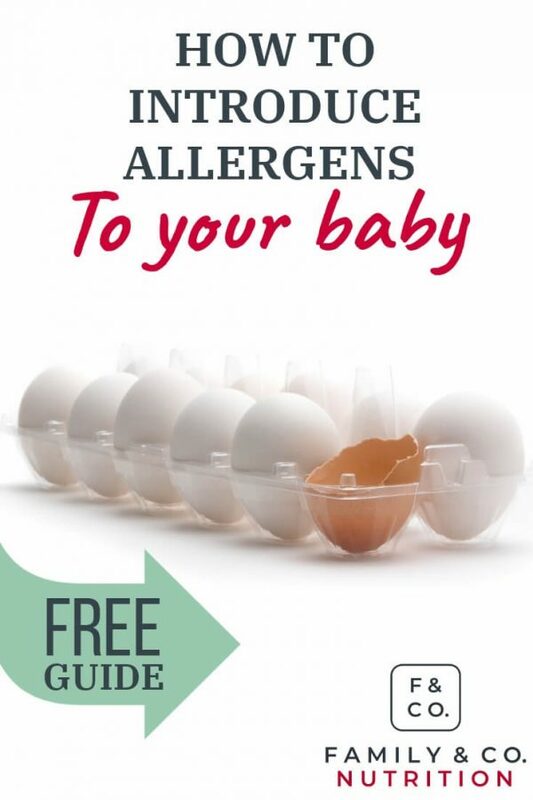 Introduce one allergen at a time, waiting 2 days before introducing another allergen. This way, you will be able to look for any symptom of an allergic reaction and know exactly which food caused it. You can offer non-allergen foods at the same time (no need to wait between these foods). For example, you could introduce scramble eggs with chopped tomatoes and parsley flakes. Here the allergen is the egg, but you can introduce tomatoes and parsley at the same time as these food are not major allergens. If an allergic reaction occurs, it would likely be due to the ingestion of the egg. How will I know if my baby has a food allergy? First, you will know that you are introducing a new allergen, so you are on the lookout for signs. Offering the allergen in the morning will allow you to monitor the reaction throughout the day (rather than having to monitor throughout the night!). 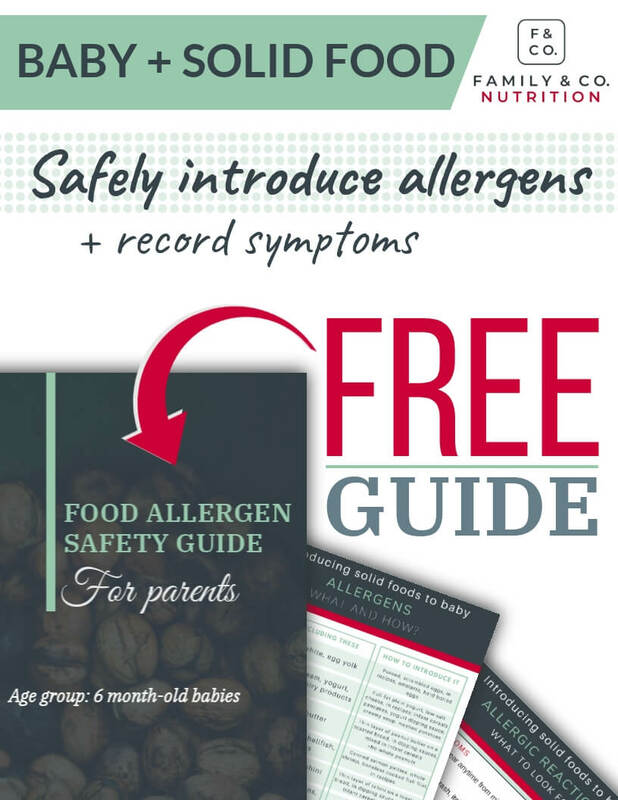 Use the symptoms diary we have created and included in the free allergen guide to record baby’s reaction. Remember, symptoms of an allergic reactions can appear within minutes to hours. If there is no reaction after your child eats the allergenic food, repeat the same allergen for 3 days as you monitor the reaction. After 3 days, if there is no reaction, it is safe to assume that your baby is not allergic. If you suspect certain foods of causing an allergic reaction (or intolerance), take note of the symptoms using the diary in your free guide. Record what your child ingested, check off what the reactions were, and any notes you think are useful. You can exclude the allergenic food from your child’s diet and see if the symptoms disappear. Bring the completed symptom diary with you at your next medical visit. Your doctor and registered dietitian will help determine if it’s a food allergy or intolerance, and what to do next. Consult your doctor or registered dietitian before excluding food groups from your child’s diet. But, do temporarily exclude foods that cause any allergic reactions. This is the best way to meet your child’s needs, and support his/her optimal growth. Mild-to-severe allergic reaction can occur after your child eats an allergen. Keep your eyes open and record the symptoms in the diary we created for you. Will my child outgrow his allergy? Kids might outgrow their allergies to dairy, soy and eggs as their immune system grow. Unfortunately, there’s no guarantee your child will outgrow a food allergy. An allergist will guide you as your child grows. It’s best to assume your child is allergic until you do a food tolerance test supervised by an allergist. Some kids will outgrow their allergy as their immune system matures. What is difference between food allergy and food intolerance? Food allergies are triggered by the immune system, while food intolerances are not. Food intolerances are digestive problems that can be as incapacitating as food allergies. Yet, they are two different conditions. It’s important to seek appropriate help for both conditions so your child has a balanced diet. This will ensure his/her growth is optimal, and that food items and food groups are not excluded with no reason. Your family doctor, allergist, and registered dietitian can help your family manage food allergies and intolerances. Although food allergies and intolerances are different, both are serious. Both need adaptation and careful attention around food. Let a dietitian help you! 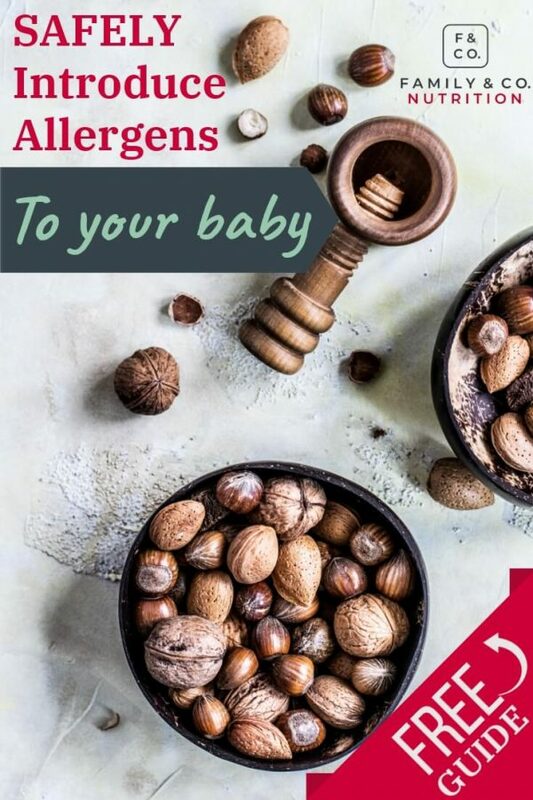 Ierodiakonou D, Garcia-Larsen V, Logan A, Groome A, Cunha S, Chivinge J, Robinson Z, Geoghegan N, Jarrold K, Reeves T, Tagiyeva-Milne N. Timing of allergenic food introduction to the infant diet and risk of allergic or autoimmune disease: a systematic review and meta-analysis. Jama. 2016 Sep 20;316(11):1181-92.